This paper comprises a review of the legacies of noted gold- and silversmiths, who opened their studios in South Africa from 1960 to1980. Through literature searches, interviews, relevant e-mail exchanges and internet searches, précis with pertinent information were composed. Information on 14 local gold- and silversmith studios are chronologically presented. Brief notes on a further 8 goldsmiths are also provided. Where possible, descriptions of maker’s marks and the years they were in use are provided. South African jewellery can compare with the best in the world. I was surprised and delighted by the high standard of the work submitted both in design and craftsmanship. Information dealing with the careers of silver- and goldsmiths who opened their workshops in South Africa from 1960 to 1980 was gathered by reviewing suitable journals and magazines such as the South African Panorama, Lantern, Artlook Magazine, The S.A. Jeweller and the Diamond News, The Diamond News and The S.A. Watchmaker and Jeweller, as well as internet searches. Goldsmiths whose work was reported in the media during the period of 1960 – 1980 were followed up where possible with internet searches, e-mail exchanges and interviews. A semi structured interview schedule was used to compose a summation of relevant aspects of their careers. This included issues such as their apprenticeships (as well as those they supervised), a characterisation of their work, important commissions, descriptions of their maker’s marks, achievements and recognition of their work. Interviews were also conducted with family members or co-workers to gain corroborating background information. Some noted South African silver- and goldsmith studios established between 1960 and 1980. The work of Erich Frey and associates Maia Holm (1962 - ), Stephen Colegate (1965 -) and Maurice Pitol (1981- ) have been extensively discussed in an earlier article. … of distinguished quality …expressing refinement and a strong aesthetic sensibility. He worked on his own and used an imprint of his name Abe Pass or only Pass as maker’s mark on his work. Figure 1: Dress ring encrusted with diamonds, emeralds and garnets by Abe Pass. Valued between R15 000 to R20 000 in 2010. During the 1950’s the main expense of jewellery making was the labour and not the materials. Funny how things have changed. In 1966 he bought a casting machine and underwent casting training in Italy. He became one of a small handful of goldsmiths who casted some of their designs. At the high point of his career he employed around 120 people in his 1000 square meter workshop. Whereas his jewellery designs were primarily influenced by Italian trends of the time, it was also dictated by market demands. Forman is also an accomplished visual artist in the fields of painting, sketching and sculpting (mostly marble, wrought iron, scrap metal and gold). Apart from holding one solo sculpting exhibition in Norwood, he did not commercially pursue his sculpt and paint work, viewing it as a hobby. He also served for a brief while on the South African Jewellery Council. First and foremost its artistic qualities must resonate with the viewer. The artistic qualities of a piece are expressed in the way that modulation or relief is unpacked in the design. Figure 2: A pistol set made of ivory and 18ct yellow and white gold encrusted with diamonds that took Mr Sid Forman three years to complete. In 2013 the set was valued at 750 000 US$. Since 1973 the House of Sid Forman won a range of awards in jewellery competitions that included the Chamber of Mines Gold Intergold Jewellery Design competition in 1981 as well as winning the Diamonds Tomorrow Student Design Competition in 1983. His wife Lorraine and two sons Mark and David hold the distinction of being the only family who have each in their own right won the coveted Diamonds International award. Before coming to South Africa in 1964, he worked in Switzerland where he rebelled against the strictures of the Goldsmith Guilds and decided to explore Africa. After an overland sojourn lasting seven months he eventually settled in Cape Town where he opened his studio called Franz Huppertz Jewellers at the Stuttafords Town Square in Adderley street. Huppertz was a prolific designer and demand for his custom made jewellery grew fast during the 1980’s and he opened a second studio showroom in Cavendish Close, Claremont, Cape Town. 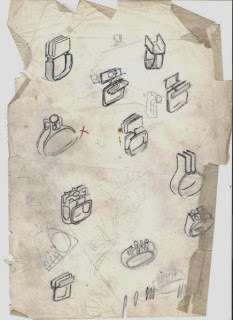 Figures 3 & 4: Ring drawings by Franz Huppertz as a student in 1961. On the right is a necklace, mask and a brooch in 18carat gold by Franz Huppertz. His art is vested in all material that has the potential to please. So even in some of his more formal work, there is surprise and amusement at the audacious use of the unconventional. … organic merging of geometric elements. 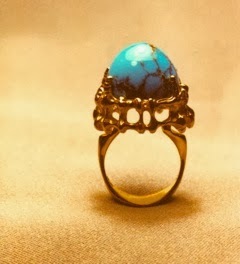 He designed around the stone and believed that the piece flows from the qualities and shape of the stone that is used. Between 1970 and 1982 Huppertz won a total of eight awards at various competitions organised by the Chamber of Mines, Diamonds of Today and Intergold competitions. In 1982 he won the overall Intergold jewellery design prize with a pair of aquamarine encrusted 18carat gold earrings, as well as winning entries in the section for men’s jewellery with a set of cuff links, along with a gold necklace submitted to the section for ethnic jewellery. Franz Huppertz suddenly passed away in 1997 at the age of 57 as the result of a stroke. A few months before his death, Mr Nicholas Opperheimer presented him with the De Beers Shining Light Award for Excellence in Diamond Jewellery Design – a timely testament to a noted goldsmith who helped to extend the range and interpretive limits of local handmade jewellery. Of German parentage, Hartmut Jäger was born in 1940 in Hitler occupied Czechoslovakia in Eger (now Cheb). After World War II the family returned to West Germany where he received his initial goldsmith training in Koblenz. He continued his studies in engraving, setting, making and designing jewellery at the Art College in Schwaebisch Gmuend. In 1965, Jäger immigrated to South Africa, working successively for goldsmiths Sid Forman, then Jack Friedman and for Anthony Sidersky before starting his own studio in 1969. He became a founding member of the Goldsmiths Guild of South Africa. At the 1975 Intergold competition he won first prizes in two pricing categories. In the late 1970’s he partnered with Jochen Kessel and opened a Jewellery shop in the Bryanston Shopping Center, of which he and his wife Ilse later became the sole owners. …’universal’ as it varies with ease according to mood and circumstances. Fine art should have the quality of taking the observer beyond his or her everyday surroundings to give them a glimpse of a greater beauty. In jewellery, an individual piece must also be crafted for the wearer as a unique expression of some quality within that person. And so the goldsmith is many in one: (s)he is sculptor, designer and visionary. (S)he must do the setting, engraving and enamelling, and master good knowledge of the many precious and semi-precious stones as well as the numerous techniques for shaping and forming of silver and gold. And (s)he must know people to sense their nature and personalities in order to serve them best. Austrian Ilse Meckel was born in 1941 and raised in Ravensburg, Germany. She studied and obtained a Masters Degree in Jewellery making in Schwaebisch Gmuend, where she also met Hartmut Jäger . After graduating, Meckel worked for leading workshops in Helgoland, Geneva and in London. With renowned London jeweller Andrew Grima, she created the famous Omega watch collection and also designed and made a brooch for the British Princess Ann. At the invitation of Hartmut Jäger, she immigrated to South Africa in 1970 to work with him in his jewellery studio. Here she designed and made a series of barely 2cm high miniature sculpture charms of animals and people in gold and silver, using the ancient 'lost-wax' moulding and casting process. In 1972 Ilse and Hartmut got married. They have two children and in 1984 the family emigrated to Perth, Australia, where Hartmut Jäger embarked on a new career as a paintings artist and graphic computer designer. 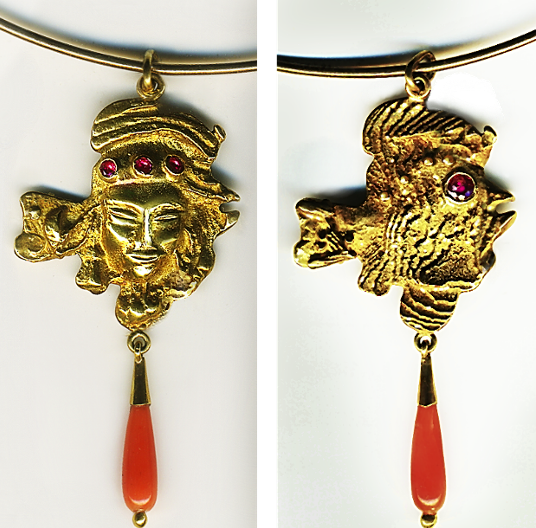 Figures 5 & 6: A double sided pendant in 18carat gold with rubies and red coral by Hartmut Jäger and three charms in gold by Ilse Jäger. During their time in South Africa, the couple made significant contributions to the local renewal of jewellery content, design and the combination of different materials that marked the late 1960’s and the 1970’s. The couple did not make use of maker’s marks. Of Italian extraction, Hector Francois (Frenchie) Gatticchi was born in 1934 in Nice, France and immigrated at the age of 13 with his parents who settled in Pretoria in 1947. In 1952 he started a three year internship in ‘mounting and precious metal working’ in the Metal Art workshop under Joe Calafato. However, the company split up in 1953 and Mr Gatticchi completed his internship with a splinter group called Pretoria Badge and Silver-Smiths Pty. Ltd in Hatfield. This group consisted of a number of people previously employed by the South African Mint, namely Mssrs. Becklacke (previous Chairman of the Mint), Percy Cave (die sinker, well known for a number of maces he produced), Myburgh and Hendriks (die sinker).This group do not seem to have made use of a maker’s mark. Gatticchi qualified with a wide range of jewellery making skills (such as the rolling, soldering and vitreous enameling of precious metals) and he went back to work for Joe Calafato for a while. In 1967, he and his wife opened their own studio under the name of Prestige Manufacturing Jewellers. From 1978 until 1980 he and Mr Charl Vorster (who also apprenticed with Joe Calafato) became partners in the business. After they dissolved the partnership, Gatticchi moved his studio and showroom to the Sanlam Arcade, Pretoria City Centre. He focused both on the jewellery making and retailing market. Amongst his clientele counted a number of government ministers and officials. He used a P as maker’s mark on his jewellery until he closed the business in 1999. Otto Poulsen was born in Denmark and completed a five year apprenticeship in Copenhagen under Willy Krogmar (a Danish sculptor/goldsmith who became known for his early modernist designs). The high standard of Poulsen’s apprenticeship work was awarded with a gold medal by the Danish Guild for Art and Craft work. He worked for a while in the Georg Jensen workshop. During this time, his development as a designer was influenced by the designs of Sigvard Bernadotte. The Danish Guild of Goldsmiths, Silversmiths and Metal Art Workers bestowed a second award on Poulsen for a bracelet he submitted in an open competition. He also worked with Henning Koppel, a well known Danish jewellery designer. 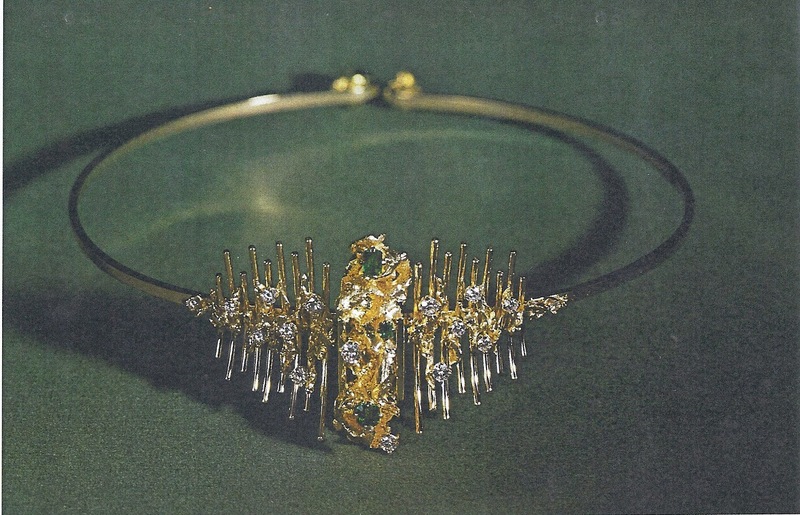 Figure 7: A choker by Otto Poulsen consisting of 16 diamonds and 3 Sandawana emeralds set in 18 and 22 carat gold. He immigrated to South Africa in 1955. He worked for a while with Kurt Jobst in Johannesburg who introduced him to a range of different materials for use in jewellery design. In the early 1960’s he relocated to Durban where he worked under his own name. At a later stage his studio amalgamated with that of Robertson’s, a long established Durban jeweller (since 1910) to form Poulsen Robertson Jewellers. He worked in gold, silver, precious and semi precious stones embedded in sculptural designs. It is clear that this goldsmith was one of our foremost talents in jewellery making during his time – he worked with the best in the Western world. Hopefully in future more information about his work will come to light. Dieter Steglich was born in 1939 in Berlin. Initially he qualified as a precision mechanic and worked at Siemens from 1955 to 1958. He had a natural flair for jewellery making, and as a hobby (without any formal schooling) he made jewellery pieces for family and friends. Based on a portfolio of his work, he was accepted for training as goldsmith at the Staatliche Werkkunst Schule in Berlin, West Germany. After successfully completing his studies and apprenticeship, he was approached by Erich Frey to join him at Frey’s studio in Pretoria. The young Dieter grasped the opportunity with both hands and worked with Frey from 1966 to 1968. For the next 20 years, Steglich continued working in the same premises under his own name D. Steglich Gold- and Silversmith. Perhaps sensing the increased vulnerability of jewellery shops to crime that would plague his colleagues in the decades to follow, he moved his workshop on 01 April 1988 to his home in Meyerspark, Pretoria. Here he worked with contentment, stating that at last he has all his tools under one roof. He was a soft spoken, self contented person, who enjoyed the solitude of his studio. He avoided crowds but was adept at having individual discussions with his clients on all matters ranging from philosophy to mechanics. He displayed an interpersonal sensitivity enabling him to translate aspects of his clients’ personae (or radiance) in his designs. For this reason (and also because of his accomplished technical ability) he worked mostly on commission and had an extensive list of loyal clientele. After being bedridden for six months, he passed away from prostate cancer in October 2006. His work gave good expression to the modernist designs of the 1970’s. Due to his initial training as precision mechanic, Steglich’s work always displayed technical finesse of the highest order, where spokes, circles, spirals and chains were interlinked with delicate balance. He won a first prize in the Chamber of Mines’ Gold Jewellery Competition in 1970 for the design of personal jewellery in gold and precious stones. He also contributed two jewellery pieces to the gold award winning South African group entry at the Arts and Crafts Fair in Florence in 1974. A total of 46 countries were represented at the fair. He had a high standard of beauty and harmonious composition… Every creation of his has this blend of outer harmony and inner care, technical precision and human sensitivity. He always searched for what he called a ‘better idea’, a more innovative way, which made him a true artist. He explored and investigated beyond the boundaries of the everyday, and was open to the multi-layered mysteries of life in his own inimitable way, soft spoken and measured, he often shared thoughtful insights and profound understanding of spiritual matters. He was an artist with matter, and a philosopher in spirit. Above all, the many times he blended spirit into matter, he unified love with substance, ultimately made him a creator in the most profound sense of the word. Figures 8 & 9: Dieter Steglich’s award winning bracelet in the Chamber of Mines’ Gold Jewellery Competition in 1970. The bracelet featured five moonstones and 12 rubies in ‘lunar-surface-textured’ gold. On the right is Mr Steglich in his studio in Arcadia, Pretoria in the early 1970s. Peter Cullman was born in Berlin in 1941 and completed his apprenticeship as goldsmith in Idar-Oberstein (1956 – 1960) followed by three years of training at the Kunst- und Werkschule in Pforzheim, Germany. In 1962 he attended a course in gemmology offered by Erich Frey who encouraged Cullman to relocate to South Africa. After spending a brief time in Israel, he immigrated to South Africa in 1963 where he worked in the atelier of Egon Wegrostek in Johannesburg. In 1966-1967 he travelled to the United States, Mexico and to Canada where he worked for Walter Schluep, a leading Canadian avant-garde jeweller. Upon his return in mid-1967 he opened his own workshop in Fanora House, Johannesburg. Here he worked until 1977 when he immigrated to Canada where he operated his own studio in Toronto between 1979 and 2003. Figure 10, 11 & 12: Examples of early work by Peter Cullman. From left to right: A turquoise matrix cabochon set in 18 carat yellow gold (1976), an 18 carat yellow gold choker with an ivory and diamond pendant (1972) and an 18 carat gold brooch set with diamonds and a pearl in the form of a sea urchin (1970). Cullman emigrated in March 1977 with his family and settled in Canada where he established his own studio in Yorkville, Toronto in 1978. He continued to work only in 18ct gold or platinum (as opposed to the Canadian preference for 10ct. or 14ct.). Here his designs explored an individualistic or idiosyncratic style that did not follow the design trends of the time. He retired in 2003. Art is the truth of the thinking and feeling of its creator – not more, not less than the plain truth. We do not make art abstract, but it becomes abstract when this is the way to say only the truth and nothing surrounding the truth which is not essential to it. The creator develops only the essence which is the truth and leaves out everything unimportant. The only success for the artist comes when he has achieved this truth in his work, whether the spectator experiences it or not. 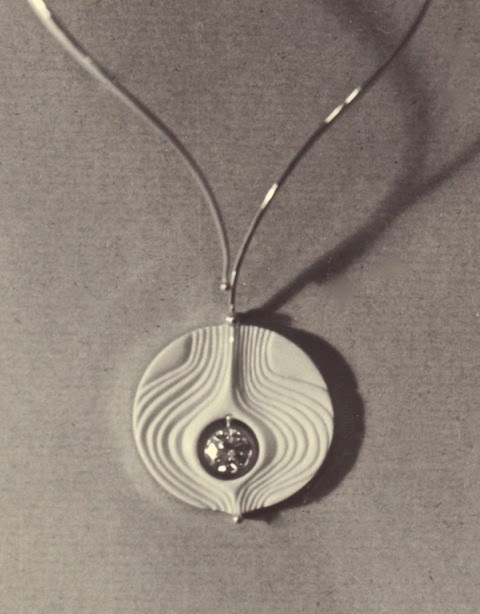 In 1968 Tessa Fleischer began exhibiting her jewellery work jointly with the sculptures of her husband in Johannesburg. In 1970 they again exhibited their work as a duo at the Pretoria Arts Association. International exposure came early in her career when she was invited to participate in the 1974 International Arts and Crafts Fair in Florence, Italy. During the late 1960’s and 1970’s she was also involved with the organisation of the annual Living Arts Biennale held in Johannesburg. … essay(s) in spiritual expression. The materials she chose to work with were selected for its inherent beauty rather than inherent value. Apart from precious metals serving as the base for her work, she made use of tumbled semi-precious stones and indigenous woods. Her work is often described as spanning the range from chunky, bold or dramatic to delicate and refined – always conceived with a sensitive aesthetic. Early inspiration for her designs was also gleaned from antique jewellery that she then reinterpreted into modern designs at the time. An important commission came her way in 1985 when the Anglican congregation of St Mary’s in Johannesburg requested her to design and make the ceremonial staff and pectoral cross for the inauguration of Bishop Desmond Tutu. It consists of tambotie wood, sterling silver, amethysts, tourmalines and garnets. Figures 13 & 14 : Left is Tessa Fleischer with Bishop Tutu’s inaugural rosier made from Tambotie wood and sterling silver. On the right is a copper, brass and onyx choker by Fleischer. From her work it is clear that much attention has been paid to detail, to the extent of creating individually designed chains that extend and accentuate the inspiration expressed in her pendants, necklaces, bracelets or girdles. Her husband’s African themed work shows a synergy with her work that was influenced by various trips in Africa. 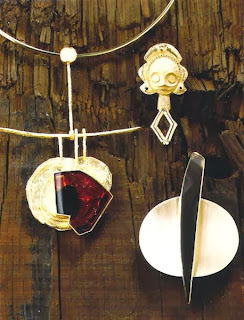 She is regarded as a creative and an imaginative jeweller with a career spanning over 40 years. Since 1974 Fleischer worked from her studio-gallery at home in Broederstroom that she shared with her husband until his passing in 1991. Her work in copper is marked with a flower pattern that is underscored by the name FLEISCHER in a half circle. She marked her work in silver with the words KUNSTGEWERBE FLEISCHER arranged in a circle around the outline of a bird. Underneath, the acronym HAN. ARB appears. Though some variation occurred over the years, all her work contained at least the imprint of her surname. Uwe Koetter was born in 1937 in Hamburg, Germany where he studied and completed his apprenticeship as goldsmith in 1957. Part of his training also included classes in pottery, enameling, silk printing, engraving, copper work and drawing. Early recognition of his promise as goldsmith came in 1958 when he was awarded the Hamburg Chamber of Commerce prize for his examination piece at the age of 20. This led to an invitation to relocate to (the then) South-West Africa to work as goldsmith in Windhoek, which he did. But the market was small and a year later he immigrated to Cape Town. Here he further honed his jewellery making skills by working for other jewelers until 1968, when he opened his own workshop with the support of his South African wife, in the Colonial Mutual Building. Already in 1973 he was regarded as a notable creative goldsmith in the country. He staged a number of solo exhibitions of his work in Cape Town. The exhibitions were extensive and each contained around 300 individual items of jewellery. The ability to create such extensive ranges of jewellery for his exhibitions is a strong testament to his prolific creativity. Koetter was commissioned by the de Beer’s Company to set the Eureka Diamond for presentation to the country’s inclusive democratic parliament at its first sitting in 1994. This was the diamond that set off the Kimberley Diamond rush in 1876, and the Oppenheimer family decided to present it to parliament. He exploits the versatility of gold in every possible way and combines it very successfully with tourmalines, garnets, rubies and emeralds. 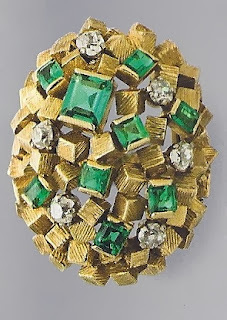 Figure 15: An 18 carat gold ring embellished with ruffled cubes, diamonds and emeralds by Uwe Koetter. Valued between R15 000 to R20 000 in 2010. … the resulting trend in jewellery is casual, almost unfinished and there is no place for precision… it is a reflection of living conditions and, as such cannot be fought … this trend will continue until there is some form of social revolution…. Designs are becoming more classical and tailored. 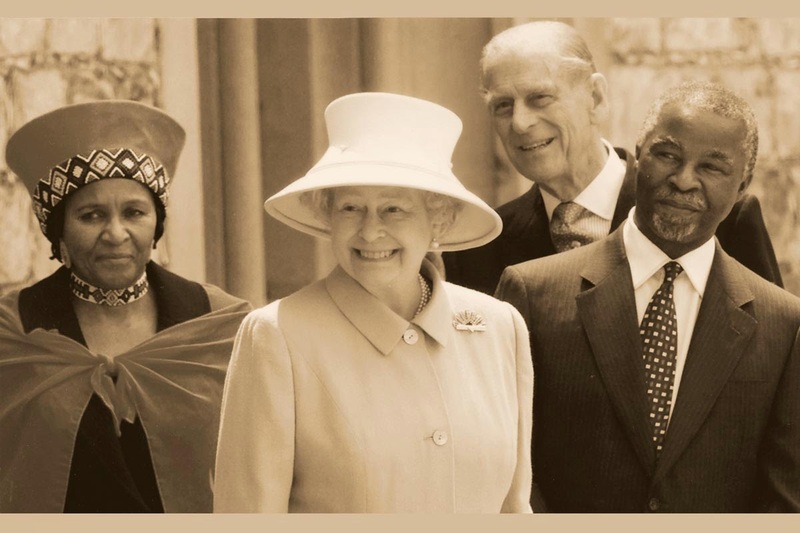 In 1995 the workshop was commissioned by the Government to design and make a brooch as a gift for Queen Elizabeth during her tour of the country. Louw designed the piece in the form of a peacock–flare symbolizing the dawn of a new era. It consisted of an art-deco style channel set baguette diamonds with a triangular diamond in the centre, set in white gold. An 18 carat gold horizon reflects the image from an old one rand note. Behind this the South African sun rises with a flair, consisting of the colours of the South African flag as captured with South African diamonds, tourmalines, onyx and gold. 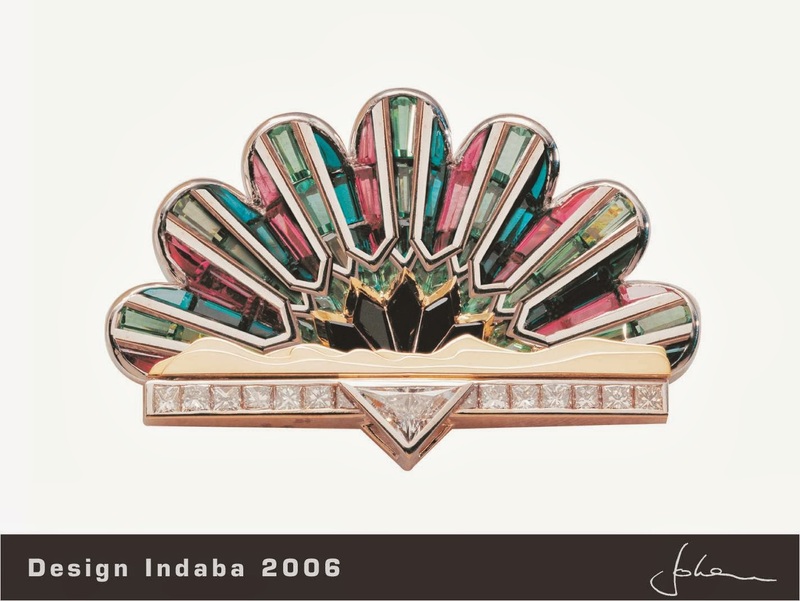 Figures 16 & 17 : Designed by Johan Louw, this commemorative brooch was presented to Queen Elizabeth II by Nelson Mandela at Tuynhuis in 1995. Contemporary and classic lines were combined to express the dawn of a new era. Yellow and white gold encrusted with local gemstones were used. On the bottom, Queen Elizabeth II is wearing the gift in the presence of the then Deputy president Thabo Mbeki, his wife Zanele Mbeki and the Duke of Edinburgh during her state visit in 1995. The workshop is presently employing a number of goldsmiths, gemologists and graders. They make all forms of jewellery in precious metals and stones, ranging from neck jewellery items to earrings to bracelets to rings. They make use of the letters U and K where the right leg of the U is merged with the vertical leg of the K.
Kurt Donau was born in 1935 in Switzerland where he received his training as goldsmith. He worked for various workshops in Chur, Geneve and in Zurich but his wanderlust drew his attention to Africa. Since the South African government at the time limited the number of goldsmiths who entered the country he applied for an initial working visa as ‘watch casing maker‘ and promptly settled in Johannesburg in 1957 with Egon Guenther’s workshop as a qualified jeweller. Here he gained valuable experience for three years. True to the European tradition of extending one’s skills base by working at a number of establishments before settling down, he then worked for Jack Friedman for seven years where he was given a free hand to contribute to the design portfolio of the Friedman workshop. In 1969 he took over Egon Guenther’s business and established his own workshop named Kurt Donau Jewellery along with his maker’s mark consisting of the letters k and d (expressed in bold, lower case). ... most fascinating, especially in terms of flamboyance and sheer weight of gold. In 1974 he was a founding member of the Goldsmiths Guild of South Africa – the first serious attempt to organise and develop the fraternity of local creative goldsmiths (this is also an indication of the fledgling nature of the profession during the early part of the twentieth century, even up to the mid 1970s it still only consisted of a loose grouping of individual gold- and silversmiths). As indication of his good standing amongst his contemporaries, Donau was regularly requested to serve as judge in a range of national jewellery competitions (1997 – 2005). 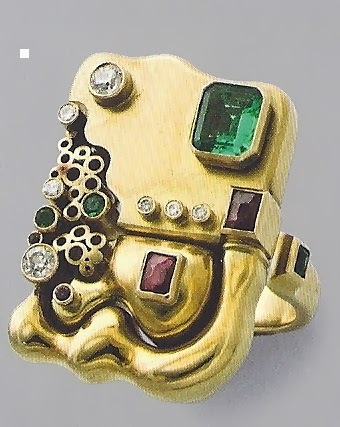 Figures 19, 20 & 21: Examples of 18 carat gold rings by Kurt Donau with Sandanawa emeralds, diamonds and ivory dyed in red. After suffering a hi-jacking and a robbery, at the age of 73 Kurt Donau returned with his family to re-settle in Chur, Switzerland in 2008 where he continues to design and create precious metal jewellery and objets d’art. Michael Cope was born in Cape Town in 1952, and in 1971 he started his apprenticeship as jewellery designer and goldsmith under the tutelage of Franz Huppertz. In 1973 he worked for E. Plaut as a jewellery designer, but soon his creative spirit found expression in his own studio, which he opened in 1974 in Cape Town. Since then he has taken part in numerous one-person and group exhibitions in Cape Town and Johannesburg, as well as exhibitions in his own studio. In 1979 at the opening of a solo exhibition in the Cape Gallery, Cecil Skotnes referred to Mike Cope as an innovator displaying great originality and technical skill. In 1980, at an exhibition in Johannesburg, Cope’s work was described as mainly figurative with a ribbed or ripple texture that results from making use of cuttle fish bone when casting his work. In 1982 he designed and implemented a formal jewellery training programme at the Royal Crown Jewellers in Maseru, Lesotho. In 2012 a retrospective exhibition of his work was curated by John Skotnes (goldsmith and son of Cecil Skotnes) at the Irma Stern Museum. Figure 22: A collection of early work by Mike Cope. His initial work was influenced by the Scandinavian design tradition of the late 1960s and early 1970s. … sculptural, often narrative with references to the periods when sculptural metalwork was most prominent in jewellery – renaissance, baroque, Arts & Crafts – though there is a modernist thread as well. He works in gold and silver, often mixing the two metals in sculptured jewellery items. He makes use of a capital letter M encircled by a C that is joined to the right bottom leg of the M as maker’s mark on his designs. He is also an accomplished poet and novelist. Ewald Kratz was born in Pforzheim, a town in the Black Forest that has long been a centre of German jewellery design and training. He followed in the footsteps of a 300 year old family tradition and completed his apprenticeship as goldsmith at the Kunst und Werkschule in Pforzheim. Subsequently, in 1965, he relocated to South Africa. Shortly hereafter he married South African Elizabeth Bezuidenhout, who just completed her studies in jewellery design at the University of Stellenbosch. In the early 1970’s both husband and wife worked for Jack Friedman in Johannesburg before they opened their own studio called Studio K in 1974. In 1973 they already showed early signs of their creative design styles by winning the Chamber of Mines Gold Jewellery Competition with an18 carat gold a necklace-choker-bracelet-buckle combination piece set with diamonds and black onyx. They produced individual work but often also collaborated. As a design team they were well suited in the sense that Ewald’s romantic flowing lines served as counterpoint to Liz’ bold and expressive approach to design. This collaboration was internationally recognised when they won the prestigious Diamond International Award in 1977. This was only the second time that the award was won by South African based goldsmiths. Their participation in a number of local competitions such as the Intergold Jewellery Design contests also yielded awards in their own individual rights as goldsmiths. In addition, they took part in the innovative 1979 and 1983 Intergold exhibitions, where the creations of local goldsmiths and local couturiers were paired. At the time, Ewald Kratz’ work was described as … (a) delicate line(s), refined, light and ethereal in places , whilst his wife’s work was depicted as having … a more everyday look about it, incorporating ivory and plastic – decidedly up to date and unusual. In 1981, a gold necklace by Ewald Kratz was crowned as overall winner of the Intergold jewellery design competition. In 1982, Liz Kratz won the bracelet section of the Intergold competition with a broad bracelet (in red, yellow and white gold) depicting the Khoi-San creationist belief that a tree gave birth to all animals and humans who lived in harmony with each other until fire was discovered. In 1986, the Kratz family resettled in Pforzheim where Ewald Kratz finalised his training as a master goldsmith. Apart from graduating in Jewellery Design and Manufacture, Liz Kratz continued to study widely in related disciplines that include Metallurgy, Geology and Gemmology. Years later, the family migrated to Brisbane Australia, where they opened a new studio under the name of Kratz Exclusive Jewellery in 1997. Their jewellery has featured internationally in all the main fashion centres of the world, including Milan, Paris, London, New York, Basle and Tokyo. 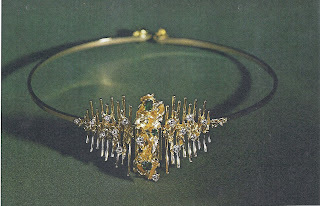 Figure 23: The Diamond International award winning entry in 1977 by Liz and Ewald Kratz, consisting of 18 carat gold, diamonds and beads. During the time of running their studio in South Africa between 1974 and 1986 they used a maker’s stamp consisting of the name of the business studio K. During these years they also used a mark consisting of the letters E and K superimposed on each other. A third mark that is still in use today consists of two overlapping 90degree triangles giving the impression of a bow tie. The years that Ewald and Liz Kratz spent in South Africa provided them with an initial platform of recognition for their work that was to be continued and celebrated elsewhere in the world. Born in Namibia, Daniel Jacobs was raised on a farm. He trained as jeweller at the University of Stellenbosch, and following his award winning entry in the 1978 ‘Diamonds Tomorrow’ competition, he was offered a position as designer goldsmith with Frowein Jewellers in Stellenbosch. Within months though, he was drafted for a two year period of military service. Upon his return in 1980, Frowein Jewellers sold their workshop operating as Stellenbosch Manufacturing Jewellers (Pty) Ltd. to Jacobs as a running concern. In 1983, he changed the name of the workshop to Goldart. In this same year, Jacobs designed and patented a multi purpose pearl clasp allowing the ‘mix and match’ combination of different strings of pearls, beads or necklaces. In 1990 he received from amongst 2000 participants, three of the seven possible awards for his exhibits at the Jewellery and Watch Trade Fair in Hong Kong. He was the first entrant ever to receive more than one award. However, their collaboration didn’t last and in 1994 the partners broke up and Jacobs opened his new studio under the name Daniel Jacobs Jewellery Design in Paradyskloof. He won the 2006 PlatAfrica competition sponsored by Anglo Platinum to stimulate and grow the demand for platinum jewellery. Other entries of his, were also selected as finalist submissions in 2006 and 2007. Jacobs describes his designs as nature inspired with a simplicity of line that affords a modernist quality to his work. At times though he also gain his inspiration from the materials (be it stone or metal) that he is working with. In terms of jewellery design, he often makes use of the golden ratio or golden proportion into his designs as aesthetic guideline. In this way, he believes that pleasing harmonious lines and dimensions can be achieved in jewellery design. Like his contemporaries, his early work reflects an extension of the use of line, relief and texture that came to the fore in the early 1970s. Figures 24, 25 & 26: From left to right: Makers marks used by Daniël Jacobs. A diamond and 18 carat gold ring that won the 1977 overall award at the Diamonds International competition. An 18 carat gold and sterling silver landscape design bracelet. Jochen Kessel was born and trained in Pforzheim, Germany and relocated to South Africa in 1969. He distinguished himself as one of the country’s top designers by winning 12 Intergold jewellery awards between 1971 and 1976, along with four international awards and a gold medal at the Inhorgenta exhibition in Munich. He already became a noted goldsmith in South Africa early on in his career. He took part in the 1979 and 1983 Intergold exhibitions, where the creations of local goldsmiths and couturiers were paired. In 1985, his work was presented by Intergold as illustrative of current international fashion expressions. His work is described as analytical rather than intuitive, making use of refined geometric shapes. In 1979 his work was described as using forms in an imaginative and unconventional way with a strong emphasis on colour. He is thought to have immigrated in the late 1980s to Brighton, England. Guy Traest was born and trained in Belgium, where he obtained diplomas in carpet- and jewellery design. He arrived in South Africa from the Congo in 1967 and opened his own studio in 1974. Initially, he expressed a preference for using ivory as base medium in his work. He regarded ivory as a versatile material that blends well with other stones, metals and organic materials. 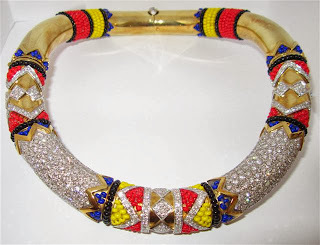 He has twinned ivory with diamonds, coral, emeralds, gold, lapis lazuli and even buffalo horn. In the mid 1970s some of his work was exported to the United States, Paris and Amsterdam. He won a number of Intergold awards. He took part in the 1979 Intergold exhibition, where the creations of local goldsmiths and couturiers were paired. In 1985, his work was also selected by Intergold in collaboration with an international fashion research bureau as representative of contemporary international fashion expressions at the time. His style is refined, expressing an elegant touch with a penchant for combining white, red and yellow gold. In 1979 his work was typified as keeping to a straight forward line. He made use of the maker’s marks guyRS as well as two stylistic capital letter Gs where the second G is turned around to become the mirror image of the first G.
Figure 27: A Choker, necklace and ring in sterling silver combined with ivory and stones from Madagascar by Guy Traest. Michael Fleming was born in 1947 in the then South West Africa. The abundance of semi-precious stones found in this country stimulated his interest in creating settings that would extend the beauty or captivating qualities of the stones. After a two year art school course in silversmithing and more than two years of practical work under a qualified goldsmith, he left for Germany and perfected his craft by training for ten years as goldsmith in Pforzheim. During this period, he spent much time studying ancient techniques in jewellery making, and became an admirer of Italian Renaissance artist Benvenuto Cellini. In 1959 he moved to South Africa where he opened a small workshop in Pretoria. Here his sister Gabi Hagg did an apprenticeship under him. His designs were well construed and executed. He made use of gold, silver, gemstones and varied other materials such as ivory and wood. He also enjoyed making use of colourful glowing enameling in his designs. His work also included enamelling. In 1975 Flemming proclaimed that his ambition was to create a design style … with definite shape and lots of movement. South African born goldsmith Gordon Watson did an internship under Flemming during the early 1970s. In 1974 both Watson and Fleming submitted work to the gold award winning South African exhibition at the 38th Art and Crafts Fair in Florence, Italy. Dieter Dill studied with Franz Huppertz at the Kunst und Werkschule, Pforzheim Höhere Fachschule in West Germany during the early 1950’s. He became a lecturer in jewellery design at the University of Stellenbosch during the late 1970s and 1980s. In 1975 his work was described as a reinterpretaion of brutal 20th century icons such as the traffic light, zebra road crossings, the vacuum cleaner and electrical pumps. Dill explored anti-classical elements in his designs such as large monumental looking pendants with simple lines or brooches expressing non-symmetric compositions. Notwithstanding the boldness of his work, the subtle use of texture and colour also gave it a graphic elegance that extended beyond the traditional boundaries of artist jewellery of the time. He repeatedly won a number of prizes in jewellery competitions, that included first prizes in the Chamber of Mines Intergold Jewellery Competition in 1973, 1976, 1981 and 1982. He also partook in the 1983 Intergold exhibition at the Chamber of Mines Pavilion at the Rand Show where couture dresses were matched with his gold jewellery. He was recognized as a noted goldsmith in South Africa. Gunther Knauer was situated in Durban and sponsored Neville Clipson and Michael Sand who won first and second prizes in the Diamonds Tomorrow Student Design Competition in 1982. German born Marianne Vossgütter (née Fisscher) completed in 1968 a degree in precious metal design at the University of Stellenbosch. For two years she worked for another goldsmith in Cape Town to gain experience before she opened her first studio under her nickname Lali, also in Cape Town. Late in 1970 she relocated to Johannesburg where she re-opened her studio in Rosebank. In 1971 she won the Chamber of Mines First Prize in jewellery design (with a pair of golden earrings set with moonstones). This served as a promising indicator of her aesthetic perceptiveness and excellent craftsmanship. In 1971 she stated that although I find it tremendous fun to make the popular and incidental jewellery, I prefer to create carefully thought out, highly individual pieces. Whereas her early work was done in gold and silver, she concentrated exclusively on silver jewellery since 1974, finding the medium more ‘free’ to work with. She incorporated pearls and semi-precious gemstones in her work, and designed her own hand beaten chains and bracelets. She maintains that her work is not commercially motivated and that this is reflected by her individually crafted pieces. One critic described her work as bold and singular. Polish born Henrietta and Ziegmunt Glogier immigrated to South Africa in 1967. They set up a workshop in Randburg, Johannesburg. They specialised in hand made silver jewellery, making use of semi-precious stones or pearls as accentuating nodes in their designs. Their work was described as strikingly simple, combining contemporary design with an antique look. Goldsmith maker’s marks that appear regularly on local antique and collectors markets include the stamps WWL and PJ on well made sterling mounting silver settings for Southern African semi-precious gemstones. Their simple art deco designs seem to stem from the 1970’s. The mark BJL also occurs on cultural icons such as brooches consisting of a baroque writing of the Afrikaans word Moeder. Two other marks that appear at times on the local antique markets are Zeeta and Oblo. Only two photo references for these marks could be obtained. Mr. W. Z. Ungar was photographed showing a range of Zeeta marked chains at the Trade Fair in 1979, and Mr. M. Oboler was photographed in front of his studio in Cape Town that bore the name Oblo Jewellers. Figure 28, 29 & 30: On top is an onyx, sterling silver and marcasite bracelet carrying the Oblo maker’s mark. Notable is the use of marcasite that was rarely used by South African creative jewelers in the 20th century.in the middle is a Zeeta marked 9 carat gold and garnet brooch. Below is a sterling silver bracelet with semi-precious stones bearing the mark WLL. The 1960s and 1970s was a time of renewal and change that was not only reflected in painting and sculpture. Synergistically, it was also expressed in jewellery design. In a new design trend, small diamonds became more liberally used in. In another transformation, creative goldsmiths began to incorporate semi-precious stones in their work and experimented with metals other than silver, gold or platinum. Organic material such as ivory and wood were incorporated in some designs. During this era, the palette for jewellery making expanded enormously. It was a time of discovery and the congruent presentation of new combinations of impressions, along with the simplification of line. More than ever before, the middle class could afford good quality individually forged jewellery items. Hierdie artikel volg op ‘n oorsig van die werk van plaaslike goud- en silversmede tydens die eerste helfte van die twintigste eeu in Suid-Afrika. Dit is vervat in Legacies of immigrant gold- and silversmiths during early and mid-twentieth century South Africa, South African Journal of Cultural History, pp 139-164, Junie 2013. Ook, An overview of noted gold- and silversmiths in South Africa in the 1950s, South African Journal of Cultural History, in druk, Junie 2014. This article follows on a review of the work of local gold- and silversmiths during the first half of the century. See Legacies of immigrant gold- and silversmiths during early and mid-twentieth century South Africa, South African Journal of Cultural History, pp 139-164, June 2013. Also, An overview of noted gold- and silversmiths in South Africa in the 1950’s, South African Journal of Cultural History, in print, June 2014. Author unknown, Design Index 1968, South African Panorama, May 1968, pp. 4-5. Author unknown, High standards at gold jewellery competition, The S.A. Jeweller and the Diamond News, April 1973, p. 31. Also, author unknown, All that glitters here really is gold, South African Digest, 06 April 1973, clipping from the art archives, University of Pretoria. Because of space limitations, it was decided to limit the review to the period 1960 to 1980 only. Also, the period from 1980 to 2000 covers a phase of significant socio-organisational change that will require a review in its own right. Reviewers were Messrs. Vic Thomson and Charles Kgosana (engravers, Pretoria), D Schilofsky (jeweller, gemologist, Pretoria) and F. Haenggi (art dealer, Basel, Switzerland). F.van Staden, Erich Frey and Associates: A bold contribution to South African silver- and goldsmith design, South African Journal of Cultural History, June 2011, vol. 25(1), pp. 148-179. Abe Pass – home page, http://www.abepass.com/indexs.htm, 2009-09-25. Also, author unknown, Goue Sierade, Panorama, June 1970, p. 25. Also, author unknown, Kaapse goudsmede presteer, Die Burger, 04 May 1976 (clipping from the art archives, University of Pretoria). E Mesman, Kuns in Kaapstad, Die Burger, 06 May 1977, clipping from the Art archives, University of Pretoria. The original Afrikaans quote is as follows: … van ‘n hoogstaande kwaliteit … toon ‘n verfyning en ‘n sterk estetiese sin. Interview: Mr A Pass, Goldsmith, Cape town, 2009-10-30. Interview: Mr. Sid Forman, Johannesburg, 2013-02-21. Other goldsmiths and workshops who made use of casting included Joe Calafato (1912-1991), Metal Art (1951-present), Simba (1954-late 1970’s), Mauro Pagliari (1957 – present) and Mari Lou (late 1950’s – early 1970’s). M. Neri, Creativity within wearability, Diamond News and S.A. Jeweller, July 1981, pp. 3, 14 & 16. Also see A.Weil, Intergold encourages innovation, Diamond News and S.A. Jeweller, September 1981, p. 15. Also, a photo clipping from Die Transvaler, 15 June 1981, p. 9 (clipping from the art archives, University of Pretoria). C. Hacker, Students present fresh ideas in De Beers jewellery contest, The S.A. Jeweller and the Diamond News, January 1983, p. 2. Huppertz studied in Pforzheim under professors Schollmeyer, Ullrich and Reiling. Source: Personal files from the Huppertz portfolio. Author unknown, Huppertz spreads his wings to décor, Diamond News and S.A. Jeweller, April 1985, p. 17. Personal documentation from the Huppertz portfolio that includes an undated newspaper clipping with the heading Invitation to Franz Huppertz champagne celebration. Telephonic interview: F.van Staden – M. Huppertz, goldsmith and daughter of F. Huppertz, Cape Town, 26 July 2012. Author unknown, Timeless gold keeps pace with the latest fashions, Diamond News and S.A. Jeweller, September 1981, pp. 25 & 27. Author unknown, Diamonds Today 1979, Diamond News and S.A. Jeweller, May 1979, pp 3 and 5, as well as author unknown, Diamonds Today 1979: Highly commended, Diamond News and S.A. Jeweller, June 1979, pp. 45 and 47. Also from Huppertz personal portfolio: Clip from the De Beer’s Dream of Diamonds Yearbook, 1988, p.8. Author unknown, Huppertz spreads his wings to décor, Diamond News and S.A. Jeweller, April 1985, p. 17. Also, a cutting from the De Beer’s Dream of Diamonds Yearbook, 1988, p.8 from Huppertz personal portfolio. Huppertz personal portfolio: Cutting from the De Beer’s Dream of Diamonds Yearbook, 1988, p.8. Telephonic interview: F.van Staden – M. Huppertz, goldsmith and daughter of F. Huppertz, Cape Town, 26 July 2012. Huppertz personal portfolio: Cutting from the De Beer’s Dream of Diamonds Yearbook, 1988, pp. 8-11. After an initial four year apprenticeship with a qualified master goldsmith, a period of working as a journeyman follows. Those who want to become master goldsmiths were then required to complete a second two year apprenticeship in the workshop of different master goldsmith before being accepted as a master goldsmith. Telephonic interview: F.van Staden – M. Huppertz, goldsmith and daughter of F. Huppertz, Cape Town, 26 July 2012. Also, personal documentation from the Huppertz portfolio that includes an undated newspaper clipping with the heading Invitation to Franz Huppertz champagne celebration. M. Neri, Creativity within wearability, Diamond News and S.A. Jeweller, July 1981, pp. 3 & 16. Also see A.Weil, Intergold encourages innovation, Diamond News and S.A. Jeweller, September 1981, p. 15. 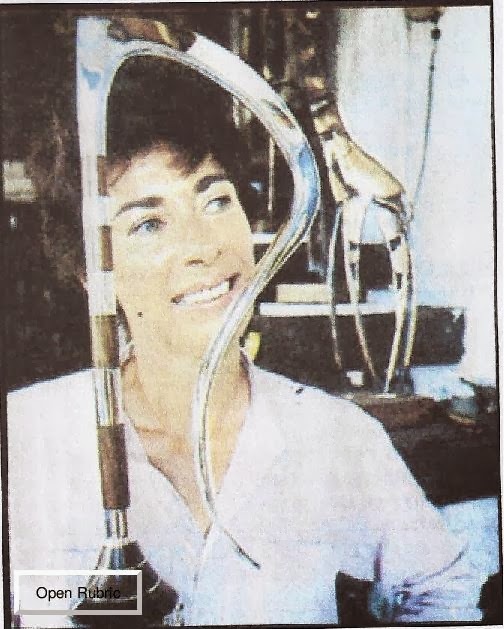 E. Moolman, Dra Boesmans se legende aan jou arm, Beeld, 09 June 1982, p. 11. Personal files from the Huppertz portfolio. Also, telephonic interview: F.van Staden – M. Nienaber, goldsmith and daughter of F. Huppertz, Cape Town, 26 July 2012. Author unknown, Eg Suid-Afrikaanse sierade, Die Huisgenoot, 18 Junie 1976, p. 69. Author unknown, Gold Gleanings, Diamond News and S.A. Jeweller, November 1979, pp. 13 and 42. See also unknown author, Timeless gold keeps pace with the latest fashions, Diamond News and S.A. Jeweller, September 1981, pp. 25 & 27. H. Jäger, Goldsmith:The Forgotten Artist, Eck World News, January 1976, p. 17. E-mail, H Jäger-F van Staden, Ilse, Hartmut and the SA Goldsmiths Guild, 13 December 2012. Also, e-mail, H Jäger-F van Staden, 3rd lot of pictures from Hartmut, 15 December 2012 and e-mail, H Jäger-F van Staden, A few more answers, 17 December 2012. E-mail, L. Kratz-F. van Staden, Re: Goldsmiths: E & L Kratz, 14 August, 2012. Apprenticeship contract of H.F. Gatticchi , signed on 29 August 1953 and termination on 07 April 1955. From Mr Gattichi’s résumé. D. van Pletzen, Mace Maker: All in a day’s work, South African Panorama, February 1973, pp. 45-46. Author not stated, Prestige Jewellers: Streng eerlikheid en top gehalte werk, Pretoria, Caxton Ltd., Johannesburg, circa 1977, p. 307. Interview: Mr H.F. Gatticchi, Pretoria, 2009-09-12. J. Prangnell, Kuns en goud, Suid-Afrikaanse Panorama, April 1963, p. 40. Sandawana emeralds are of the rarest and most perfect emaeralds in the world and is mined in Matabele land in Zimbabwe. Poulsen Robertson, http://www.otto-poulson.co.za, 2011-12-04. Efforts to obtain more information on both the Otto Poulsen and Robertson legacy from the present owners were unsuccessful. G. Hughes, The renaissance of the artist-jeweller, Optima, September 1970, p. 110. G. S. Geyer, Die goudsmid, sy kunswerk en plek in die samelewing, unpublished research report in Art History III, University of Pretoria Art Archives, undated (possibly the early 1970s). Interview with Gisela Steglich and Sonja, wife and daughter of Mr D Steglich, Meyerspark, Pretoria, 08 November 2013. Also see the Family eulogy, In honour of Dieter Steglich, 15 October 2006, from the Steglich family résumé. Steglich was a genius in solving mechanical problems and could fix any break down caused by mass manufacture or cheap engineering with innovative solutions. Like many creative goldsmiths, he detested mass manufactured goods. He had a great love for his 1959 Volkswagen Beetle that he fitted with a Porsche engine and maintained in spotless condition throughout his life. Personal photo albums from the Steglich Résumé, 08 November, Meyerspark, Pretoria, 08 November 2013. Author unknown, S.A. wins gold, ARTLOOK, May 1974, p.28. Also, author unknown, Goue Sierade, Panorama, June 1970, p. 24. Author unknown, Ons beste goud en silwer…, undated newspaper clipping, Art archives, University of Pretoria. G. S. Geyer, Die goudsmid, sy kunswerk en plek in die samelewing, unpublished research report in Art History III, University of Pretoria Art Archives, undated (possibly early 1970s). D. van Zyl, Eulogy, Meyerspark, Pretoria, 15 October 2006. From the Steglich family résumé. At the time Frey took a sabbatical and was teaching for a year before finally immigrating to South Africa in 1964. Author unknown, H Peter Cullman, Artlook, November 1968, p. 3. H Peter Cullman, http; www.art-archives-southafrica.ch/CULLMAN.htm, accessed 2012-06-12. J Ambrose-Brown, Jewellery in South African Art, Macdonald, Cape Town, 1978, p.50. Also, author unknown, Goue Sierade, Panorama, June 1970, pp. 24 & 25. Also, author unknown, Jeweller’s art, Sunday Express, 17 November 1974, clipping from the art archives, University of Pretoria. E. Frank, Peter Cullman, Artlook, September 1971, p. 33. Erich Frey, a contemporary of Cullman, was also emphatic in his conviction that designers are inevitably influenced by the surrounding worlds in which they live. E-mail correspondence: P. Cullman – F. van Staden, Goldsmiths Guild et al, 2012-07-12, as well as Re: Goldsmiths Guild, et al, 2012-07-14. E. Frank, Peter Cullman, Artlook, September 1971, pp. 32-33. H Peter Cullman, http; www.art-archives-southafrica.ch/CULLMAN.htm, accessed 2012-06-12. Also, e-mail correspondence: P. Cullman – F. van Staden, Goldsmiths Guild et al, 2012-07-12. M. Fleischer, Michael Fleischer, Artlook, October 1969, p. 33. Michael Fleischer came to South Africa in 1963 as sculptor on a large government commission. Another notable commission was his design for the opening of the Hugenote tunnel in the Cape in 1989. Additional references: Author unknown, Michael Fleischer – Metal Sculptor, ART LOOK, November 1968, p. 5; R. Cutler, Architectural sculpture, Style Magazine, June 1983, pp. 90-94; B. Davitz, Groot projekte op Michael se kerfstok, Die Transvaler, Januarie 03, 1989, p. 12. Author unknown, Juwele uit afvalstukke, Die Tranvaler, 04 December 1968 (clipping from the art archives, University of Pretoria). Untitled clipping from the Pretoria News, dated 11 September 1970, from the art archives, University of Pretoria. Author unknown, Art on show, South African Panorama, July 1974, p.20. T. Curteis, Tessa Fleischer’s Jewellery, ART LOOK, April 1969, p.26. C.Rolfes, Mountains of Talent, Sunday Times Magazine, September 06, 1987, pp.56-58. K. O’Reilly, Local artist creates symbolic staff for Tutu’s inauguration, The Star, February 1, 1985, p.12. Author unknown, S.A. wins gold, ARTLOOK, May 1974, p.28. Also, see J. Kotze, Presents of mind and spirit at art gallery, Pretoria News, 21 October 1974. Clipping from the Art Archives, University of Pretoria. R. Cheales, Sculptures show a family affair, THE CITIZEN, March 28, 1987, p.19. Also, A. Cremer, The Artful farm, SA Country Life, January 1996, pp. 26 – 31. Author unknown, Personalities in the diamond trade, The Diamond News and S.A.Jeweller, April 1977, p.5. Also, U. Koetter, Curriculum Vitae, from the Koetter résumé. Also, author unknown, ‘n Meester met goud, Die Landbou Weekblad, 26 May 1970, pp. 71 and 88. L.Dellatola, Jewellery Council, South African Panorama,, December 1973, p. 1. Author unknown, Master ‘Midas’ , The Argus, 25 April 1972, p.27. Also, unnamed photograph with caption on a charity solo exhibition by Uwe Koetter, The Argus, 1972-04-29, p. 6. Also, M. Levitt, Koetter stages elegant display, The Diamond News and S.A. Jeweller, December 1979, p.22, as well as M. Levitt, New jewels at Koetter display, The Diamond News and S.A. Jeweller, November 1980, pp.3 & 49. Also, G. Cooper, Gertrude Cooper’s People Page, Cape Times, 29 September 1979, from the Koetter résumé. U. Koetter, Curriculum Vitae, from the Koetter résumé. M. Levitt, New jewels at Koetter display, The Diamond News and S.A. Jeweller, November 1980, p. 49. Undated (possibly early 1970s) newspaper clippings, Juwele se musiek bekoor steeds, and Real craftsmanship not necessary but -, from the Koetter résumé. Newspaper clipping, Passport lifestyle, June 1977, from the Koetter résumé. Undated, Juwele se musiek bekoor steeds, and Real craftsmanship not necessary but -, from the Koetter résumé. Also, author unknown, ‘n Meester met goud, Die Landbouweekblad, 26 May 1970, pp. 71 and 88. Also, author unknown, Exciting combination of gemstones, The Jewish Herald, 24 July 1979, from the Koetter résumé. Also, E. du Toit, Ringe vir aldag en eendag, Die landbouweekblad, 3 November 1978, p.115. An undated newspaper clipping titled Win for Jeweller, from the Koetter résumé. Also, Uwe Koetter Flash, October 1997, from the Koetter résumé. Aziz Hartley, Designers show their golden touch, Cape Times, 25 July 2003, p. 7. E-mail: J. Louw – F. van Staden, Uwe Koetter history, 2009-01-10. Also, E. Moolman, Dra Boesmans se legende aan jou arm, Beeld, 09 June 1982, p. 11. P. Diamond, Johan Louw designs jewel for the queen, Diamond News and S.A. Jeweller, May 1995, p.13. Uwe Koetter- home page, http://www.uwekoetter.co.za/mainsite/content/view/12/23/, 2009-09-25. F.van Staden, An overview of noted gold- and silversmiths in South Africa in the 1950’s, South African Journal of Cultural History, June 2014, pp. 139-163. Eberhard Dechow, Arbeiten aus Südafrika, Goldschmiede Zeitung, 1970, vol.68(4), p. 417. 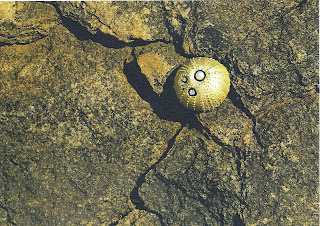 Riches of Africa More than 100 enter Gold Jewellery Design Competition, AngloGold Ashanti, http:www.anglogoldashanti.co.za/Additional/Press/AngloGold/1998/10+Dec+1998, 2009-09-27. Also, e-mail correspondence: K. Donau – F. van Staden, Kurt Donau, 2012-02-01. 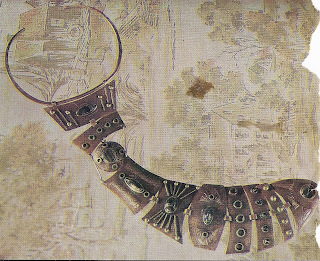 J Ambrose-Brown, Jewellery in South African Art, Macdonald, Cape Town, 1978, p.50. D. Schöbi, Ein Rheintaler Goldschmiedt kreiert Schmuck für Königinnen, Unser Reintal, 31 October 2011, pp. 1-3. Author unknown, Linking gold, threads, The Star, 13 November 1979. Clipping from the Art Archives, University of Pretoria. J.A. Brown, Jewellery, South African Art, Macdonald South Africa, Cape Town, 1978. Also, http://donau-handcrafted-jewellery.ch/About.html, accessed 2012-01-05, as well as John Skotnes TED profile, http:www.ted.com/profiles/bio/id/305081, 2009-09-27. Author unknown, Catalogue one: session five, item 921, Stephan Welz and Co., Johannesburg, 24-26 April 2012, p. 196. L. Dellatola, Gold and fashion, South African Panorama, March 1980, p. 41. Since the dawn of democracy in the early 1990’s, increased attacks on jewellers and their workshops has played its role on increased security expenses as well as the emigration of qualified goldsmiths. Another outflow is reflected in the development of a culture where women do not easily display their jewellery publically anymore, for fear of being robbed. M. Levitt, Unusual exhibition, Diamond News and S.A. Jeweller, November 1979, p.47. Author unknown, Juwele uit die Kaap, Beeld, 22 Februry 1980, clipping from the art archives, University of Pretoria. Internet: About Michael Cope, http://www.cope.co.za/Note.htm, 2009-09-30. E-mail: M. Cope, Retrospective exhibition call for jewellery items, 2012-05-25.
unknown, Timeless gold keeps pace with the latest fashions, Diamond News and S.A. Jeweller, September 1981, pp. 25 & 27. M. Neri, Creativity within wearability, Diamond News and S.A. Jeweller, July 1981, pp. 3, 13 & 14. Also see A.Weil, Intergold encourages innovation, Diamond News and S.A. Jeweller, September 1981, p. 15. A. Weil, Gold Gleanings, Diamond News and S.A. Jeweller, January 1980, pp. 10, 11 & 13. Also, author unknown, Gold in fashion, Diamond News and S.A.Jeweller, March 1983, pp. 29-31. Also, author unknown, Goud in die mode, Suid-Afrikaanse Panorama, Julie 1983, pp. 48-50. A photo clipping from Die Transvaler, 15 June 1981, p. 9, (from the Art Archives, University of Pretoria). 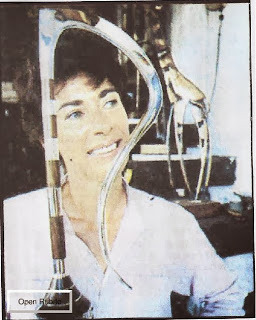 E. Moolman, Dra Boesmans se legende aan jou arm, Beeld, 09 June 1982, p. 11. The winning piece was designed by Liz Kratz and made by her husband Ewald Kratz along with colleague David Tranter. Author unknown, Diamonds Today 1979, Diamond News and S.A. Jeweller, May 1979, p. 5. Author unknown, Diamonds Today – 1979 Highly Commended, Diamond News and S.A. Jeweller, June 1979, p. 45. A. Weil, Huppertz triumphs at Intergold Jewellery design competition, Diamond News and S.A. Jeweller, July 1982, p. 3. E-mail correspondence: P. Cullman – F. van Staden, Goldsmiths Guild et al, 2012-07-12. Also, www.kratzjewellery.com.au, accessed on 2012-07-16. J Ambrose Brown, South African Art, Macdonald South Africa, Cape Town, 1978, p.50. E. Kruger, Talent wat skitter. Suid-Afrikaanse Panorama, November/December 1990, pp. 34-37. Author unknown, French partner for Goldart, Distrikspos, 10 December 1993. E-mail, re Daniel Jacobs geskiedenis, 2013-12-01. P. Diamond, Prizes for Stellenbosch, Diamond news and S.A. Jeweller, January 1990, p. 13. D. Jacobs, Keynote address, Jewellex Exhibition, Sandton Convention Centre, Johannesburg, 02 September 2013. The golden ratio occurs when the ratio of two measurements is the same as the ratio of their sum is to the larger of the two measurements. The golden ratio is expressed in mathematics as the irrational or infinite number 1.618033… and is denoted with the Greek letter phi. It is held by some artists and architects that aesthetically pleasing proportions are attained when their work incorporate approximations of the golden ratio. E-mail, Re: Daniel Jacobs Jewellery Design, 2009-10-20. Follow-up e-mail, re Daniel Jacobs geskiedenis, 2013-12-01. E. Phillips, They are creating beauty in metal, newspaper clipping (courtesy of Hartmut Jäger), 1975. Also, author unknown, Kunstenaars se juwele sal harte steel, Die Burger, 29 April 1980, clipping from the Art Archives, University of Pretoria. Author unknown, Gold Gleanings, Diamond News and S.A. Jeweller, November 1979, pp. 13 and 42. See also A. Weil, Huppertz triumphs at Intergold Jewellery design competition, Diamond News and S.A. Jeweller, July 1982, p. 11, as well as unknown author, Timeless gold keeps pace with the latest fashions, Diamond News and S.A. Jeweller, September 1981, pp. 25 & 27. E-mail, L. Kratz-F. van Staden, Re: Goldsmiths: E & L Kratz, 14 August, 2012. Author unknown, Hy toor met ivoor, Die Transvaler, in the Klaradyn/mode section, 2 November 1977. Clipping from the Art Archives, University of Pretoria. A. Weil, Gold Gleanings, Diamond News and S.A. Jeweller, January 1980, pp. 10, 11 & 13. Author unknown, Gold Gleanings, Diamond News and S.A. Jeweller, November 1979, pp. 13 and 42. E-Mail, S. Botha , Guy Traest identifisering, 18 August 2013. Maisie Levitt, Cape duo team up, Diamond News and S.A. Jeweller, December 1986, p.28. Author unknown, Golden stylist, SA Digest, 21 February 1975. Clipping from the Art Archives, University of Pretoria. Author unknown, S.A. wins gold, ARTLOOK, May 1974, p.28. Author unknown, Ons beste goud en silwer…, unreferenced newspaper clipping, Art Archives, University of Pretoria, 1974. Author unknown, Juweliersware op Worcester, Kuns en Vermaak section, Die Burger, 20 June 1975, p. 13. Author unknown, Kaapse goudsmede presteer, Die Burger, 04 May 1976 (clipping from the art archives, University of Pretoria). M. Neri, Creativity within wearability, Diamond News and S.A. Jeweller, July 1981, pp. 3, 15 & 20. Also see A.Weil, Intergold encourages innovation, Diamond News and S.A. Jeweller, September 1981, p. 15. A. Weil, Huppertz triumphs at Intergold Jewellery design competition, Diamond News and S.A. Jeweller, July 1982, pp. 3,11 and 13. Also, E. Moolman, Dra Boesmans se legende aan jou arm, Beeld, 09 June 1982, p. 11. Author unknown, Gold in fashion, Diamond News and S.A.Jeweller, March 1983, pp. 29-31. Also, author unknown, Goud in die mode, Suid-Afrikaanse Panorama, Julie 1983, pp. 48-50. Author unknown, Lali works in silver and gold, The Star, 19 October 1971 (clipping from the Art Archives, University of Pretoria). C. Hacker, Goldsmith turns to silver, Diamond News and S.A. Jeweller, February 1982, p. 37. B. Parker, Home & Art, ARTLOOK, December 1971, p. 32. Author unknown, Trade Fair 1979, Diamond News and S.A. Jeweller, August 1979, p. 38. Author unknown, Trade Fair 1979, Diamond News and S.A. Jeweller, August 1979, p. 39. Also, Mike Oboler was a ‘manufacturing jeweller’ from Cape Town, who contributed to the continuing hallmarking debate at the time and was quoted as being strongly in favour of a instituting a national hallmarking system: We need a system with a quick turn-around time, non-destructive testing, recognition of special conditions (for example small manufacturers) and with standards that are internationally acceptable. Also, see J Hobbs, SA hallmarking – one step nearer, Diamond News and S.A.Jeweller, December 1984, p. 32. Author unknown, Modern Jeweller, Artlook, No. 37, December 1969, pp. 21-22. Also, see author unknown, No time-lag in setting the watch fashion pace.., Rand Daily Mail, 10 May 1971, clipping from the Art Archives, University of Pretoria. Author unknown, Elegant en ‘n bietjie gewaag, die Transvaler, 06 July 1971, clipping from the Art Archives, University of Pretoria. Hi Bea, Thanks for telling me about this mark. Interesting. I have not come across it yet. If one has to speculate, the acronym RSA was only used since 1960. Does the person who sold it to you know anything about the provenance of the ring? Hello, I apologize for the delay in my response. The ring was a local thrift shop. I tried adding picture but was unable to. Today I bought a very nice 750 gold Maltese cross pendant at a local flea market for 2,00 Euro. The initials DAJ are on the bail. On the top of the cross is a mark I don't recognize, then 750 and another mark that looks like a "9" or a "g". I've been searching for "DAJ 750 pendant" but haven't found anything specific. The cross weighs 1.67 grams. Thanks for any help! My apologies for only responding now. The jeweller could be Daniel Jacobs from Stellenbosch. He used these initals for about a decade during the late 1970's. See my review of him in the article above. The numerals 750 possibly indicate the gold content (750 parts in a 1000) or 18ct gold. This sounds like a good piece. Jacobs' work has been celebrated, especially during the era that this piece was made. Hi, I have a beautiful gold ring with a garnet, it has the word ZEETA inscribed on the inside but no gold markings. Does anyone have any information that may help me track the goldsmith please. Hi also have a gold cameo Zeeta. Have you been able to get more information? There is a latest collection of gold set design at online store ejohri, They are offering exclusive range of indian jewellery, bridal jewellery, women's jewellery to add sparkle & glamour to the auspicious day of your life.